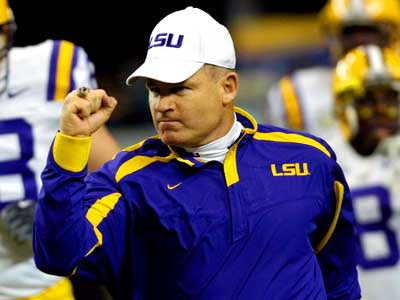 Via a report from WAFB in Louisiana, Michigan AD Dave Brandon met with Les Miles this evening rather than tomorrow, which is when it was widely reported that the two would meet. 9 Sports has learned that Miles and UM's Dave Brandon met Monday evening at Miles' field house condo off Nicholson Drive. Brandon and two other Michigan representatives left the meeting and were taken to Baton Rouge Metro Airport in a Cadillac Escalade, where they were seen boarding Brandon's Domino's Pizza plane at 7:40 p.m. The plane left moments later. Is this Dave Brandon or Tony Stark? I can't tell? 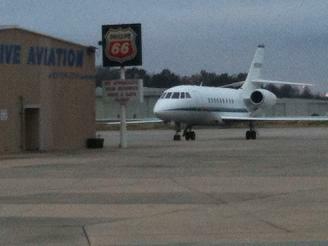 The plane in question, Dave Brandon's Domino 1, as it has been referred to, as of this post in en route to Willow Run from Baton Rouge. I wonder who the 2 other UM representatives are? Lloyd Carr? Folks, I'm not a betting man, but if I were, I'd bet the house on Miles at this point. All signs are pointing to him as the next Michigan coach. As of this post, we're not aware of any specific offer being made, but it's safe to say that if Brandon is flying back to AA tonight and not tomorrow, that's a sign that whatever meeting that took place went either really well, or really ugly. Given Miles' answers about his future lately, I'd say the meeting probably went well. We'll see tomorrow. I have a feeling we're getting really close to an announcement. More news at 11.